Expecting visitors? Welcome them in style with a guest bedroom that’s warm and inviting. Your guest bedroom will most likely be used by all different kinds of people, from friends and parents to in-laws and out-of-town guests, so creating a space that can adapt over time is key. When choosing your colour scheme, think simplicity: the idea is to create a beautiful, neutral canvas that can be dressed up with soft furnishings and other accessories. A clever colour trick when you’re aiming to create a cosy space is to combine two or three shades from one colour family. 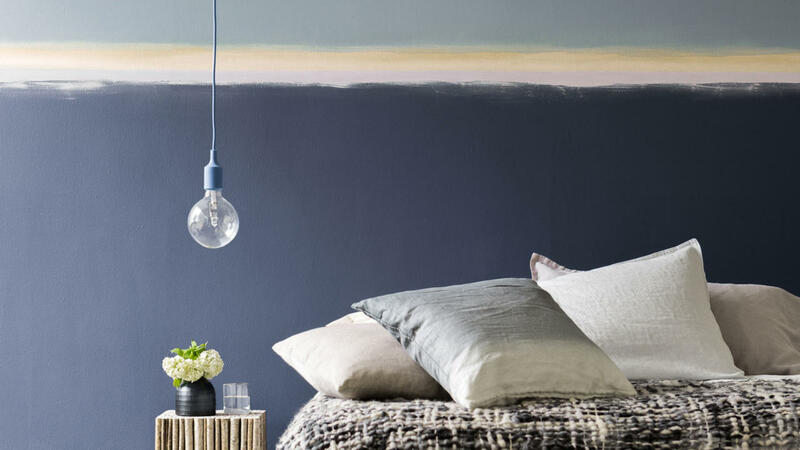 For example, if you love blue, you could combine indigo, denim blue and violet – as seen in this beautiful bedroom. To create a similar paint effect as seen on the walls here, use loose brushstrokes to create the rough line effect and for the best effect, don’t load the brush with too much paint. Or if neutrals are more your style, why not pair a darker grey, such as pewter, with a soft dove grey and feathery white? When it comes to accessorising your guest bedroom, why not continue the theme of visual contrasts by mixing different textures and surfaces together? Silk fabrics look fabulous when layered with wool fabrics on the bed or you could combine different surfaces together, such as a mirrored table with matt timber chairs. A few personal touches like a beautiful painting, a vase of fresh flowers or a framed photograph will ensure the room is always ready for guests – even those who turn up unexpectedly!